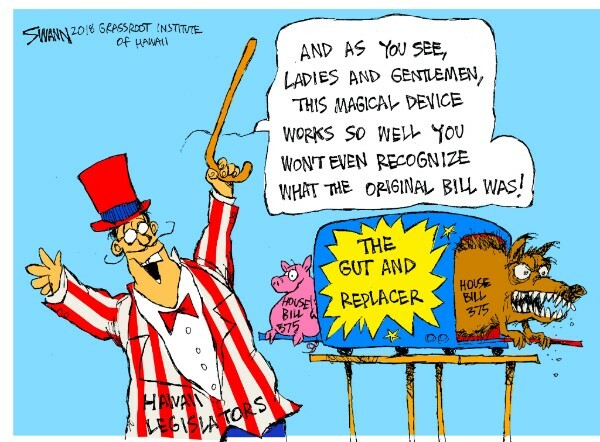 (Honolulu, HI)— Common Cause Hawai`i and the League of Women Voters of Honolulu today filed a complaint against the State of Hawai`i, to curb the use of “gut and replace” during the legislative process and protect the public’s voice in democracy. The complaint seeks to void Act 84 (2018) on the grounds that SB2858 was radically changed late in session, which denied the public a meaningful voice in its passage and deprived legislators adequate time to thoroughly review the consequences of the change. The gut and replace tactic violated Article III, sections 14 and 15 of the Hawai`i State Constitution, the complaint states. The original version of SB2858 would have required the Department of Public Safety to prepare an annual report with performance indicators regarding efforts to improve recidivism rates and inmate rehabilitation. After crossing over to the House, the House Committee on Public Safety, deleted (gutted) its contents and replaced it with language from a completely unrelated bill. The final version of the bill requires the State to consider (but not necessarily meet) hurricane resistant criteria when designing and constructing new schools. The complaint coincides with the fifth annual Rusty Scalpel Award, established by Common Cause Hawai`i and the League of Women Voters in 2014 to expose and curb the widespread abuse of gut and replace. The watchdog groups decided to increase pressure on lawmakers to end the practice this year with the legal complaint. SB2858 was an abhorrent abuse of gut and replace in 2018, but it is far from the only problem. In previous years, the good government groups awarded the Rusty Scalpel Award to bills that transformed from proposals to fund conservation, improve health care and reduce tax liability for low-income people to bills that helped the private sector or special interest groups. LINK: Click here to read the complaint. Common Cause Hawai`i is a state chapter of the national Common Cause organization. Common Cause Hawai`i is a nonpartisan, grassroots organization dedicated to protecting and improving Hawai`i’s political process and holding government accountable to the public interest. For more information, please visit hi.commoncause.org.